The weather is warming up and it’s time to dust off the dreariness of the winter and start dreaming of those balmy summer nights and long days at the beach. 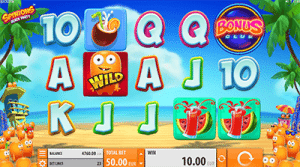 Before you start firing up the barbie and filling up the esky, get into the summer spirit with these lively and upbeat summer themed pokies, which are available to play for real money bets at the top-rated casinos on the Internet. 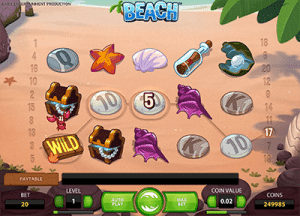 One of the hottest releases of 2016, QuickSpin’s Spinions Beach Party is super bright and cheerful, embodying the spirit of the summer more so than any other online pokies game. Here you get to join the whacky little Spinions (who look more like orange Tic Tac’s) as they take to the coast for a Tropicana style fiesta. Amongst the golden sands and leafy palms, the five-reels are filled with all kinds of fruity cocktails and champagne, plus bonus symbols like wilds and scatters. The Spinion Wild symbol is a real cracker, and when you land two of these anywhere on the reels they trigger the Spinion Sticky Wild Re-Spin, where the wild symbols are held in place for one free re-spin, continuing until no new wild symbols appear. There is also a Beach Club Free Spins feature where you receive 10 free spins complete with sticky wilds. No game will get you thirsty for summer quicker. For those who look forward to summer for the scantily clad hotties on the beach, Microgaming has the game for you. Bikini Party delivers exactly what the name promises – a bunch of women running around in two-piece swim suits as they enjoy a beach volleyball game. Symbols consist of the bikini clad girls, including a brunette, blonde and redhead, and there are multiple bonus features with 243 Ways to Win. An appearance of the volleyball scatter symbol awards 15 free spins where all wins are tripled, and free spins can be re-triggered, providing the chance for some gigantic wins. You can also opt to use the re-spin feature for an extra cost, where you get to spin one reel at a time in an attempt to complete a larger winning combination. 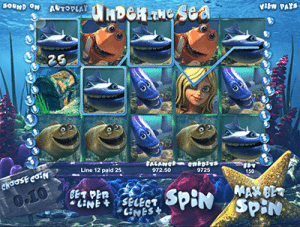 Under the Sea is part of BetSoft’s impressive collection of 3D pokies, with the use of three-dimensional animation working awesomely with the underwater theme. Given the high-quality animation, it’s a little reminiscent of Finding Nemo, although Under the Sea follows a theme entirely of its own. Amongst the coral, starfish and sea plants, the five-reels are filled with animated fish, sea creatures, treasure chests, pearls, sunken ships and treasure chests. The pearl hidden in an oyster acts as the games wild, which not only awards bigger wins but also works as a multiplier, awarding a X8 payout for three wild symbols in an active payline. An appearance of three treasure chests triggers the bonus game, where you get to hunt for treasure on the bottom of the ocean for the chance to win extra credits. NetEnt’s Beach is a bit of an unofficial throwback to The Little Mermaid, with the reels filled with lively sea creatures that can’t help remind us of Sebastian the lobster from the Disney classic. This game is a little older, but it still holds up, especially if you’re looking for a slot game that stirs up the desire for the salty ocean air. Beach is a five-reel game where rather than the symbols spinning on a traditional reel, they are literally swept into place by the tide. With each new wave, new symbols are swept onto the sand, housing shells, pebbles, clams, starfish and if you’re really lucky, treasure chests and messages in bottles. Instead of free spins, you can trigger free waves, and the appearance of the bouncy octopus wild multiplies all wins by X2. If you’re familiar with Thunderkick’s software, you’ll already know that Thunderkick pokies are in a league of their own when it comes to creativity and boundary-crossing. Sunny Scoops is a truly unique slot game that’s difficult to compare to any other. Instead of reels with spinning symbols, Sunny Scoops consists of three different ice cream cones, with different coloured and flavoured scoops of ice cream falling down to see if a winning scoop is formed before the cones scoot off screen to make way for new ones. On top of the innovative game format, Sunny Scoops has not one but seven bonuses, so every spin has you on the edge of your seat. There’s a Bonus Wheel packed with multipliers, a free spins bonus and a climbing multiplier where you can create a mountain of ice cream scoops for some monumental wins. Not only full of thrills, this will leave you craving a trip to your closest ice cream parlour for that true taste of summer. If you’re looking for a safe and reputable place to play real money pokies online, we recommend checking out Raging Bull Casino, our top-rated casino site for players from United States, which has hundreds of real money pokies to choose from and some great welcome bonuses for new players.